Climate action was on the ballot in yesterday’s election. By electing candidates who ran on platforms to protect the planet for future generations, voters picked the environment as a winning issue. 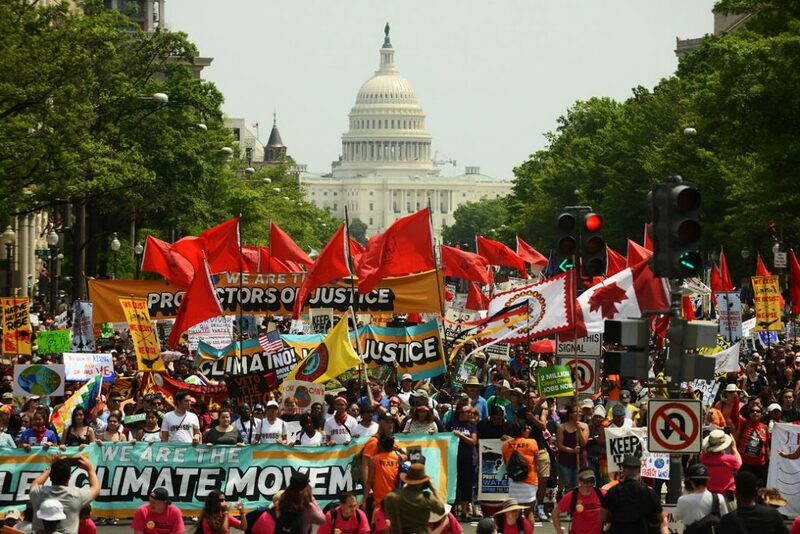 In the absence of national leadership on climate from the Trump administration, it is more important than ever for U.S. leaders at the state and local levels to pursue an aggressive plan for climate action—something that voters supported in the 2018 midterms. From the East Coast to the Midwest to the desert Southwest, these six newly elected governors ran, in part, on combating climate change and building a clean energy economy, ushering in stronger climate leadership from their respective states and setting an example for the rest of the country to follow. For context, the states whose leaders have already begun to take climate action or are newly elected and have pledged to do so in the future are now responsible for 37 percent of U.S. greenhouse gas emissions and represent 55 percent of U.S. gross domestic product (GDP)—amounts comparable to the total emissions of India and the total GDP of Japan, Germany, and Russia combined. This column takes a closer look at six newly elected governors who have pledged to take action on climate. During his campaign, former businessman J.B. Pritzker acknowledged that as one of the country’s largest greenhouse gas emitters, Illinois has an obligation to help tackle climate change. To support this effort, he pushed for the development of clean energy in Illinois, in part through a promise to get Illinois to 25 percent clean, renewable energy by 2025 and 100 percent clean, renewable energy by 2050—a policy that he believes will create more jobs in Illinois. Pritzker also has plans for Illinois to join the U.S. Climate Alliance. According to the U.S. Energy Information Administration (EIA), Illinois consumed 38 million tons of coal in 2017, making it second only to Texas in terms of coal consumption. This makes Pritzker’s clean energy plans all the more bold and necessary. In contrast, Pritzker’s opponent, former Gov. Bruce Rauner (R), did not address climate change directly during his campaign. Instead, he continued to cultivate relationships with the state’s coal industry. Former Maine Attorney General Janet Mills is no stranger to tackling climate change. As attorney general, she joined in filing legal action against the Trump EPA’s proposed rollbacks of the Clean Power Plan and the clean car standards. Unlike her opponent, businessman Shawn Moody, Mills made clear in a recent debate that she not only believes in climate change, but that it must be urgently addressed by moving away from fossil fuel energy sources as soon as possible. Throughout her campaign, Mills noted that climate change is a threat to Maine’s economy due to the impact it could have on tourism, agriculture, and the forest and fisheries industries. In contrast to climate champions in landlocked states, Mills underscored how climate change will affect Maine’s coasts and beaches, and she supported taking steps to make communities in those areas more resilient today, not down the road. Finally, Mills has been supportive of further developing Maine’s offshore wind capacity. During her campaign for governor, former State Sen. Gretchen Whitmer pledged to enter Michigan into the U.S. Climate Alliance—a bipartisan group of 17 governors committed to reducing their states’ greenhouse gas emissions in line with the Paris agreement. She supports transitioning to 100 percent clean energy, upgrading Michigan’s aging electric grid to cut waste, and investing in electric vehicles to reduce emissions and create jobs. She has also pledged to create a “department of the Great Lakes and Fresh Water,” which would contain an Office of Climate Change—an agency responsible for looking at the impacts of climate change across the state of Michigan. In contrast, Whitmer’s opponent, former Michigan Attorney General Bill Schuette (R), signed onto a legal brief earlier in 2018 that questioned the scientific consensus surrounding climate change. As Clark County commissioner and on the campaign trail, Steve Sisolak disagreed with the Trump Environmental Protection Agency’s (EPA) proposed rollback of the Clean Power Plan and with the administration’s decision to exit the Paris agreement. Instead, Sisolak championed the idea that Nevada needs to “invest in a clean energy future.” In his role as commissioner, Sisolak helped make Clark County—home to the desert metropolis of Las Vegas—a leader in solar energy. In an effort to further the development of alternative energy, he supported a ballot initiative—which passed—that will raise the requirement of energy used by utilities to 50 percent by 2030. In contrast, when Sisolak’s opponent, Adam Laxalt, served as attorney general, he filed a brief challenging the ability of the EPA to regulate carbon emissions under the Clean Air Act and joined a brief in defense of oil giant Exxon Mobil Corp.
Former Rep. Michelle Lujan Grisham has long been an advocate for reducing greenhouse gas emissions, both in Congress and throughout her push for the governorship. During her race, she lamented New Mexico’s shrinking role as a clean energy supplier and campaigned on turning it around, touting job creation and fewer emissions as major benefits. As governor, Lujan Grisham aims to reintroduce New Mexico’s RPS, increasing the state’s renewable energy portfolio to 50 percent by 2030 and 80 percent by 2040. In contrast, her opponent, Rep. Steve Pearce (R), has questioned established climate science, even while a significant hot spot of methane—one of the most potent gases responsible for climate change—sits right over New Mexico. Former Wisconsin Superintendent of Public Instruction Tony Evers campaigned on a plan to pledge Wisconsin’s support to sections of the Paris climate agreement—in part through joining the U.S. Climate Alliance—as well as to review Wisconsin’s carbon and other greenhouse gas emissions levels and to commit to a 100 percent transition to clean energy. In a debate, Evers affirmed his support for climate science when he said that he would restore scientist positions in the Wisconsin Department of Natural Resources that were cut by former Gov. Scott Walker (R). In contrast, his challenger, Walker, has questioned whether humans are changing the climate. These gubernatorial victories underscore the importance of climate action to state citizens. Even as the Trump administration continues to deny the science behind climate change and undo any policy aimed at action, the nation is at a critical moment. The most recent Intergovernmental Panel on Climate Change (IPCC) report found that, with its current emissions patterns, the world is on a path to exceed its carbon budget in a mere 12 years, which would lead to extreme temperature jumps. This indicates the urgent need for drastic climate action. As these governors-elect lead the way on climate action, the newly elected Congress must also follow the wishes of voters and hold the Trump administration accountable for its attempts to benefit polluters at the expense of the American public. The outcomes of these races show that voters care about and support climate action. If these state leaders can lead on climate action, then so can each state’s representatives in Washington, D.C. The country will be watching. Christy Goldfuss is the senior vice president for Energy and Environment Policy at the Center for American Progress. The author would like to thank Sally Hardin, Angelica Lujan, Meghan K. Miller, and Steve Bonitatibus for their contributions to this column.